I’ve been sucked into the vortex of Halloween in the blogosphere lately. Time to wrench myself from its gravitational pull and highlight a few other things. 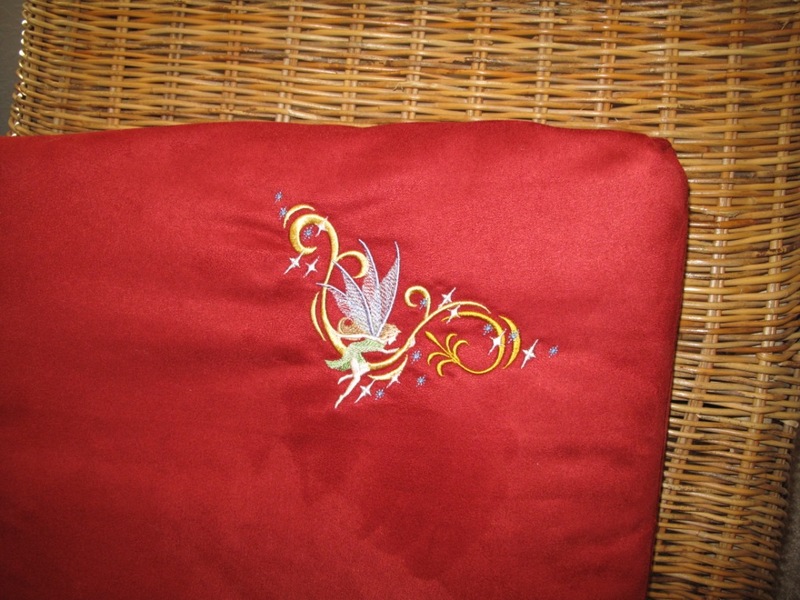 Looks like I’ve been light on postings on machine embroidery, so time to address that. In sharing machine embroidery projects, I want to be careful not to tread on the rights of the digitizers whose patterns I use. If you purchase a pattern, detailed instructions with pictures accompany them (or at least they do for the ones I’ll highlight). 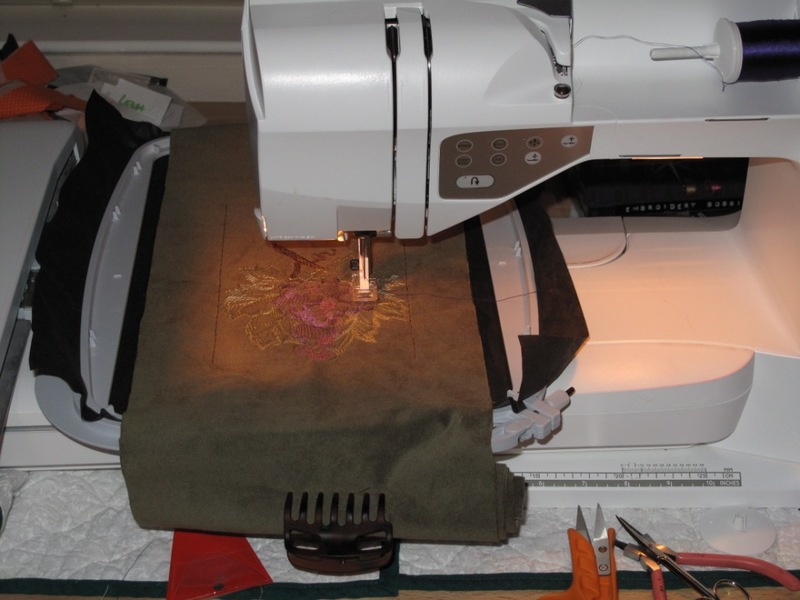 If you don’t do machine embroidery – you may still garner ideas from the post as long as you keep in mind you can hand embroider, appliqué or photo transfer an image in any of the places I use the machine to make a design. 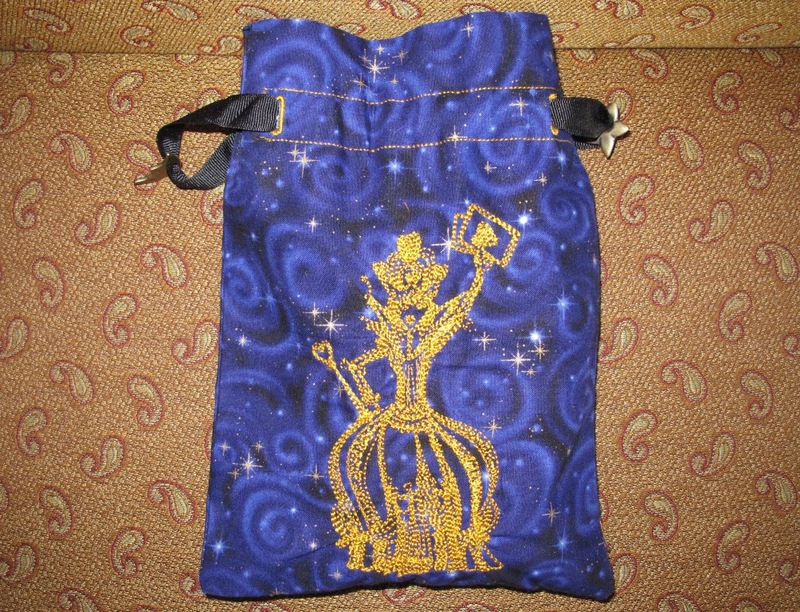 My little Queen of Hearts Tarot Bag was made for a friend. The Queen of Hearts design is from Urban Threads. I used the drawstring bag pattern from MooseBeStitchin. It gives you 2 perfectly stitched buttonholes plus drawstring casing stitched lines – definitely worth the price of the pattern (drawstring bags are very easy to construct sans pattern, here’s a free ehow pattern). Plus, you can add machine stitched windows to the bags if you like. However, I wanted it lined, this pattern was not, and I did not follow the cardinal rule of doing a pattern once as instructed before messing with it. 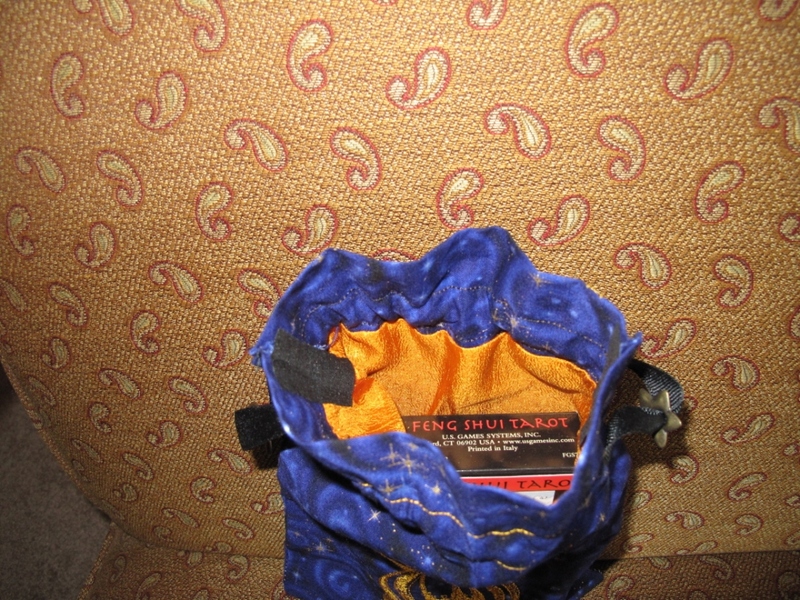 So, I did muck it up a tad, requiring more effort than would have been needed had I thought it through (you can see the little squares of black I used to cover exposed stitching inside the bag below). However, I’m pleased with the end results and will be stitching up a few more. The Fabric is JoAnn quilting cotton and the lining is charmeuse (polyester). I’m partially through a wine bag that will also have a drawstring top. My favored restaurant in Murphys, Grounds, allows you to bring in a local wine for your dinner with no corkage fee. A few others do the same. So, friends and I are often lugging in a bottle in a brown paper bag as though we were some wino walking down the street. Crafting abilities to the rescue J. The fabric is upholstery weight microsuede I have left over from another project. It’s heavy enough that I won’t line it but will utilize a nice size upper hem to give it a polished look. For stabilizer I turned to a black tear away from Allstitch.com. I thought the fabric was heavy enough that it should be fine, but you’ll notice it puckered, I should have gone heavier weight. 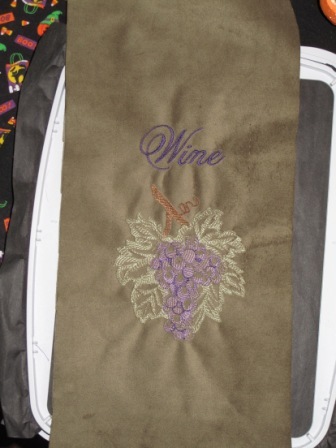 The design is a combination of Embroidery Library grape bunch sheer plus their word wine. In the hoop below you can see I rolled the fabric that will be the back and used an inexpensive plastic hair clip to hold it out of the sewing area. These things are a must. If you’re doing t-shirts or other completed garments you want to be sure you keep the fabric that shouldn’t be stitched on outside of the stitching area and you don’t want that fabric to create a lot of drag on your hoop (the machine does the design by moving the hoop with the needle always going straight up and down). The plastic hair clips are a useful tool. It came out a bit more muted than I expected, but I was going for subtle, so it’s ok. Given that I’m using a drawstring, I think the design puckers won’t be noticeable as such (it will look like what happens with the top scrunched together). The chair is IKEA. 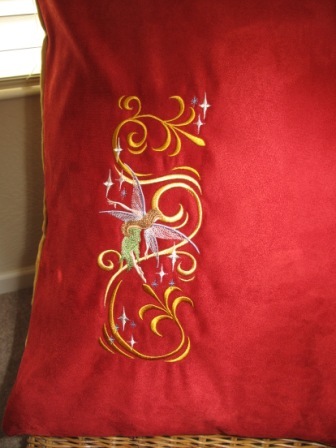 Fabric is microsuede to match a whole gold, deep red, muted green scheme I have running throughout most of my home. Designs are Embroidery Library Fairy Fantasy Border and Corner. 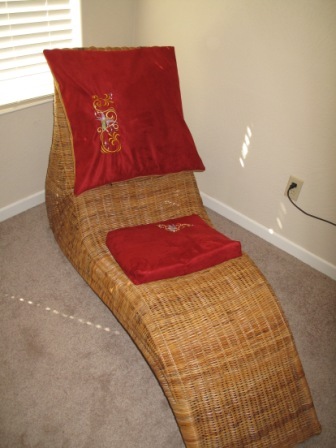 The seat cushion is squared by the sewing technique explained as “mitered corner” for cushions on ehow. 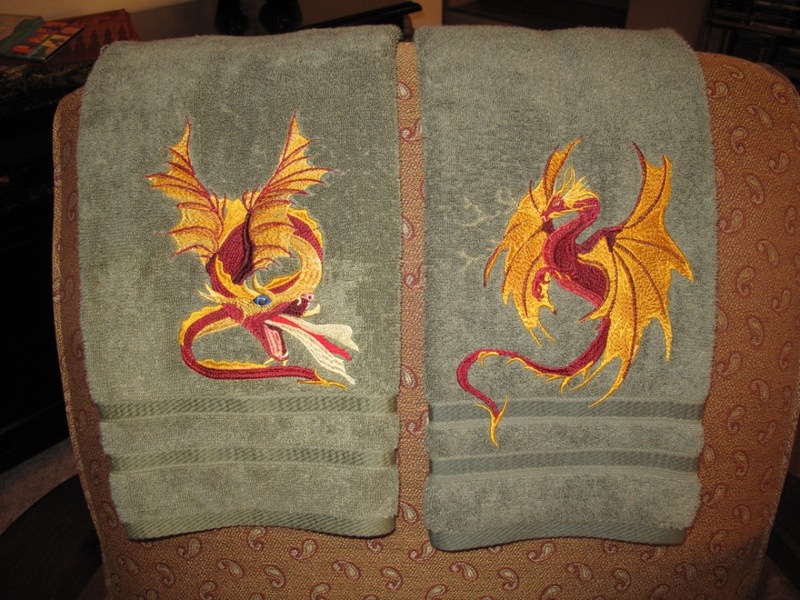 Finally, I’ll share the towels that go in the private bath. The dragons make me smile. They are Embroidery Library’s Lightening Dragon and Cernunnos from Cactus Punch’s Dragons, Fins and Faerie Things. Machine embroidery adds the easy ownership of cloth, design, design size and every thread color to a crafter’s arsenal of tools and I love it.